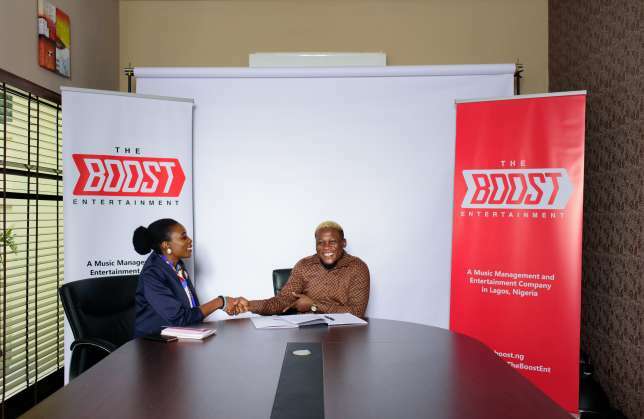 Nigerian songwriter/singer, Kay Jay Ogbonna, who had previously signed a futile record label deal in the past, has just landed a multi million naira management deal with ‘The Boost Entertainment’ which will be in charge of all his bookings and management affairs. The singer is from Abia State and started music professionally in 2012 as a songwriter, composing songs for top artist in the music industry. Kay Jay is set to release a new single in November 2018 produced by Blaq Jerzee, as well as announcements of future endorsements and partnerships, and plans for his body of work coming soon. He is currently nominated for the Nigerian Entertainment Awards 2018 ‘Fresh Vibes of The Year’ category alongside the likes of Peruzzi. “I signed with The Boost Entertainment firstly because we have the same vision, I see them making me one of the biggest artists in Nigeria and beyond. Despite being newly established, this is one of the first and few music management companies in Nigeria that fund the artist, and I feel that is how it should be – it gave me even more assurance to work with them. They are not just bringing funds, strategy and ideas; they are bringing full hands on involvement and direction, with a unique attention to visual content creation – this is the structure that many (new/upcoming and young) Nigerian artists require to launch and succeed, our problems have always been how to finance and how to promote our music. The Boost Entertainment will provide all the support I require to achieve my goals and dreams. Five years from now I see myself becoming a big brand, winning multiple awards, opening an NGO to give back to communities by feeding the homeless and helping the less privileged. I also hope to write a book about the business of songwriting, in which I will detail the challenges we face as songwriters in the Nigerian music industry“.